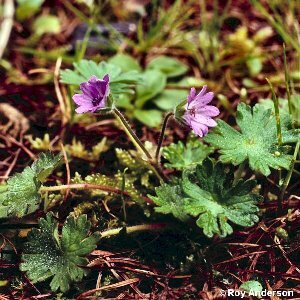 This is the characteristic crane's-bill of the coast on sand dunes, dry banks, walls and pasture. Although it can grow to over a foot (30cm) in height, it is usually much shorter, often kept very short by grazing rabbits in sand dune grasslands. 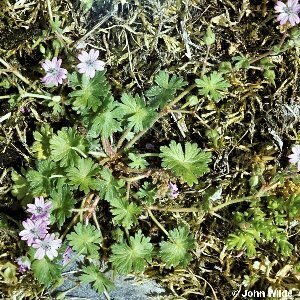 The whole plant is softly hairy, the flowers are about half an inch (c. 12mm) across, and the petals are pink or pinkish-purple and notched. As well as its coastal habitats, this plant is widespread and frequent inland, in dry grassy places and cultivated land. All names: Geranium molle L.